The fit was perfect, the arrival was as promised. The function so far is as expected. I am very pleased. -Michael M.
Get a Complete Stereo Package for your Classic, Motorcycle or UTV! 6, 12, and 24 Month Financing Plans Available. Find the things you need. Apply and Buy. Pay over time. We know Classic Cars. We Know Audio. We know Which Radio is Right for You! 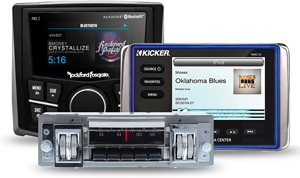 We carry original looking classic car stereos from Custom Autosound for Buick vehicles from 1954-1981. Whether you are looking for an AM/FM radio for your 1956 Buick or looking to add a CD changer to your Skylark, we have Buick radios, speakers, and other audio accessories and products that fit and look seamless with your original dash. Don't cut up the dash of your classic Cadillac in order to replace your original radio. Our Custom Autosound classic car radios for Cadillac's all feature an auxiliary input so that you can listen to your iPod. Our classic car stereos, speakers, and other audio products for Cadillac are custom kitted for your specific year. ClassicCarStereos.com offers Custom Autosound, classic car radio for a wide variety of Chevy cars and trucks. Whether you are completely restoring a classic Corvette, or looking to replace the radio in your Camaro, we offer three different classic car radio models for your classic Chevy. All of our classic car stereos are custom kitted for your vehicle and come with a 2 year warranty. Whether you have a 40's Coupe or a Mustang, we offer a radio to fit your vintage Ford vehicle. We offer Custom Autosound and Antique Automobile Radios that are designed to look as original as possible and give you the technology of a modern radio without forcing you to cut your dash. Many of our classic Ford radios feature the officially licensed logo on the radio itself. Update the classic car radio in your GMC truck so that you can play your iPod with either the Custom Autosound USA-230, USA-1, or USA-630 radios and keep your dash looking original. No cutting or modifications are required. Even on early vehicles, we offer classic GMC radios for vehicles with and without the factory push buttons. We offer classic car radios and vintage car audio for vintage Lincoln vehicles from 1946-1957. Whether your vehicle is from 1948 or 1978, we have classic car stereos from Custom Autosound kitted to fit your classic Lincoln vehicle in the factory dash location. The Secretaudio stereo system works great in many Mopar applications. This radio system allows you to hide the head unit,or "brains",of the system in your trunk or under the seat and control it remotely with a wired LCD display or a wireless handheld remote. We also feature some original style Mopar radios for classic Barracudas,Chargers and Roadrunners. 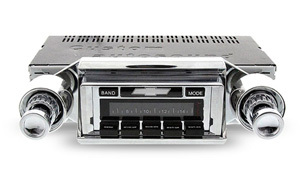 With radios to fit Oldsmobile vehicles from 1940-1983, ClassicCarStereos.com has vintage car radios, speakers, and other audio products for classic Oldsmobile's that look original, yet offer the technology of today's modern car stereos. 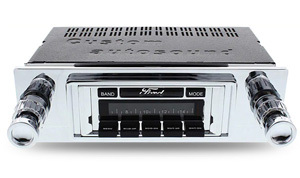 We have both the USA radio models and Secretaudio stereo systems to modernize your vintage car. Replace your old Pontiac radio with classic car stereos from Custom Autosound which specifically fit the GTO, Firebird and Tempest. We offer three different classic car radio modelsthat will all look factory in your dash with no cutting or modifications required. All of our models feature an electronic tuner, AM/FM radio and auxiliary input. Cutting the dash of your classic Studebaker would be sacrilegious. Now you don't have to with the Custom Autosound USA-230, USA-1 and USA-630 vintage car radios which are custom kitted to fit your specific year and feature the technology you would find in a new car stereo. Get the best sound out of your Studebaker with ClassicCarStereos.com. You will no longer need that radio block off plate or stereo glove box with the selection of Custom Autosound radios from ClassicCarStereos.com which are designed to fit your vintage VW Bug, Bus or Karmann Ghia. All of the VW classic car radio products are designed to fit in the original dash location with no modifications required. Still Have Questions? - Get Our Free Buyer's Guide!